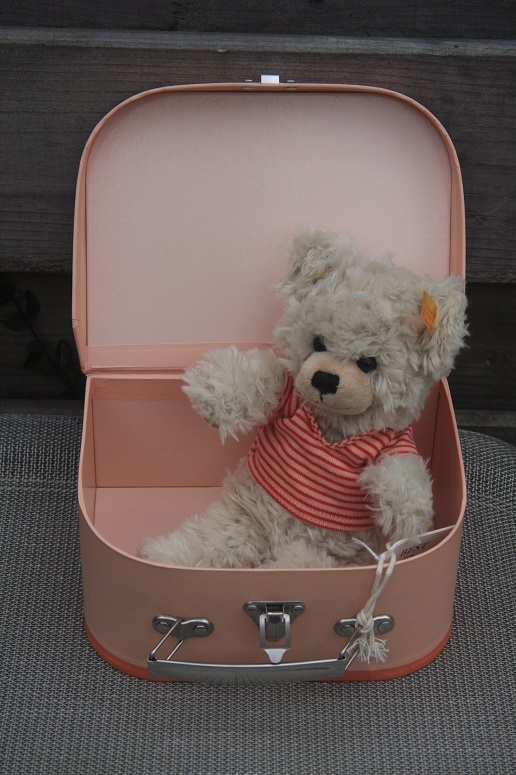 Sweet and soft teddy bears with their Suitcases. 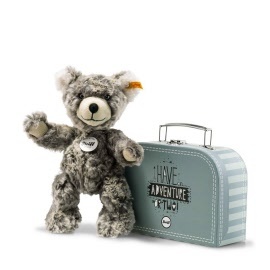 Ready to go on any adventure but also to nice to carry everything your teddy needs, Teddy with suitcase. 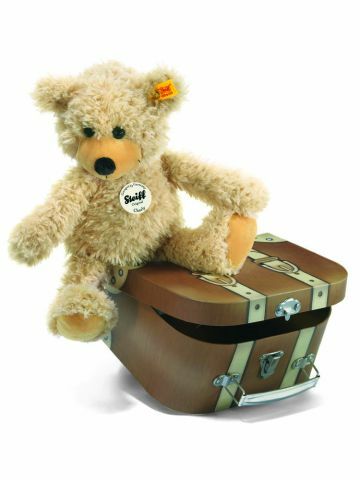 Steiff EAN 113352 Sunny teddy with suitcase, 22cm. Sunny is made out of soft white plush. He is filled with synthetic filling material. Sunny has a plush nose and safety eyes. She comes with a little box. Steiff EAN 114014 Sunny Teddy with suitcase, 22cm. Sunny is made out of soft brown plush. He is filled with synthetic filling material. Sunny has a pluche nose and safety eyes. He comes with a little box. Fynn is made of soft beige plush and has safety eyes. He is stuffed with synthetic material. Fynn is machine washable at 30 degree C and has the CE mark for safe toys. The suitcase is not washable. Fynn has a button in his left ear. Lotte is made of soft white plush and has safety eyes. She is stuffed with synthetic material. Lotte is machine washable at 30 degree C and has the CE mark for safe toys. The suitcase is not washable. 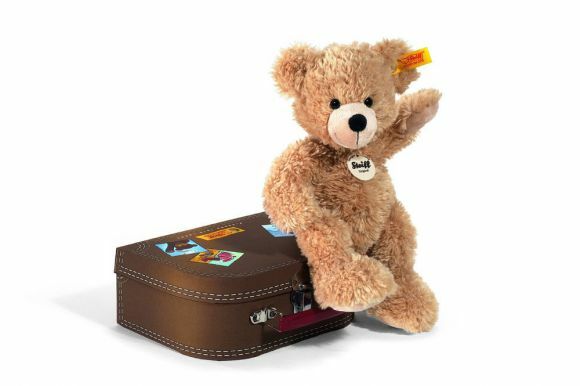 Steiff EAN 111471 Fynn Teddy in suitcase, 28cm. 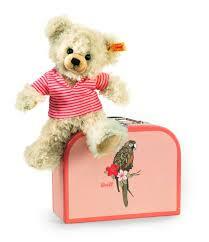 Steiff EAN 12938 Charly in suitcase 30cm. Charly is made of soft creme plush and has safety eyes. He is stuffed with synthetic material. Charly is machine washable at 30 degree C and has the CE mark for safe toys. The suitcase is not washable. Charly has a gold plated button in his left ear. Charly is made of soft creme plush and has safety eyes. He is stuffed with synthetic material. Charly is machine washable at 30 degree C and has the CE mark for safe toys.(T1). His boat is also a bag. 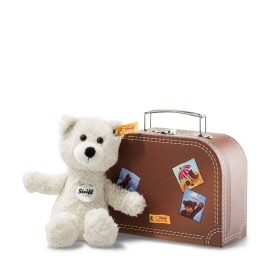 Steiff EAN 111211 Lenny in Suitcase, Lenny is 22cm. Lenny is made of soft beige plush and has safety eyes. He is stuffed with synthetic material and pellets. Lenny is machine washable at 30 degree C and has the CE mark for safe toys. The suitcase is not washable. Lenny has a gold plated button in his left ear. Steiff EAN 111341 Pia in suitcase, Pia is 22cm. Pia is made of soft beige plush and has safety eyes. She is stuffed with synthetic material. Pia is machine washable at 30 degree C and has the CE mark for safe toys. The suitcase is not washable. Pia has a gold plated button in her left ear. 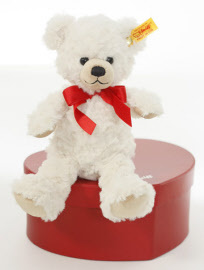 Teddy Sweetheart is 22 cm tall and made out of creme plush. Shee has safety eyes and is stuffed with synthetic material. The red box is not washable. Sweetheart has a gold plated button in her left ear. 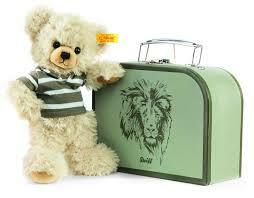 Steiff EAN 111730 Fynn Teddy in suitcase, 23cm. 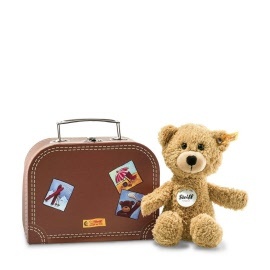 Steiff EAN 111464 Lotte teddy in suitcase, 28cm. Steiff EAN 045486 Posh Pattern Pets Darlin Deer, 23 cm. Darlin Deer is made of brown/white cuddly soft plush. He has safety eyes and is stuffed with synthetic filling material. He is standing. He is machine washable at 30° C, suitcase not washable, and has the CE mark for safe toys. He has a stainless steel “Button in Ear”. 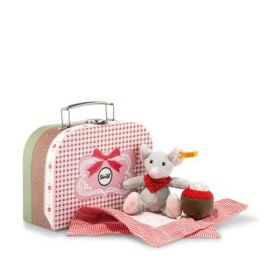 Steiff EAN 113604 Picnic Friends Mr. Little in Suitcase, Mr Little is 12 cm. Mr. Little is made of grey/multicoloured cuddly soft plush. He has safety eyes and is stuffed with synthetic filling material. 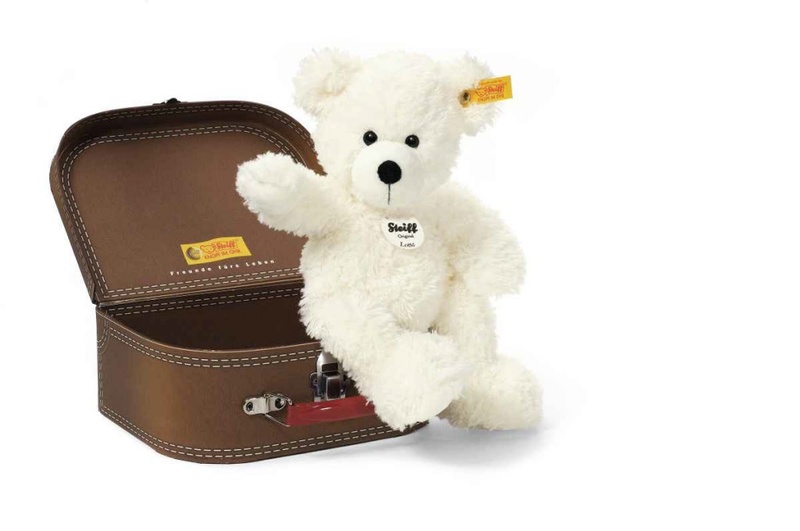 He is machine washable at 30° C, suitcase not washable, and has the CE mark for safe toys. He has a stainless steel “Button in Ear”. 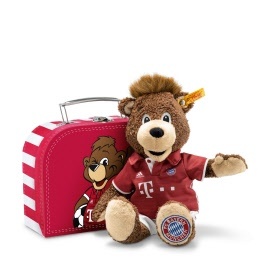 Steiff EAN 024504 Bernie FC Bayern in suitcase, 26cm. Bernie is made of brown cuddly soft plush. He has embroidered eyes and is stuffed with synthetic filling material. 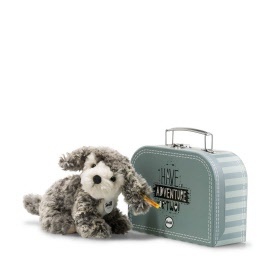 He is machine washable at 30° C, suitcase not washable, and has the CE mark for safe toys. He has a stainless steel “Button in Ear”. She is machine washable at 30° C (suitcase not washable) and has the CE mark for safe toys. Steiff EAN 113390 Sunny Teddy with suitcase, 22 cm. 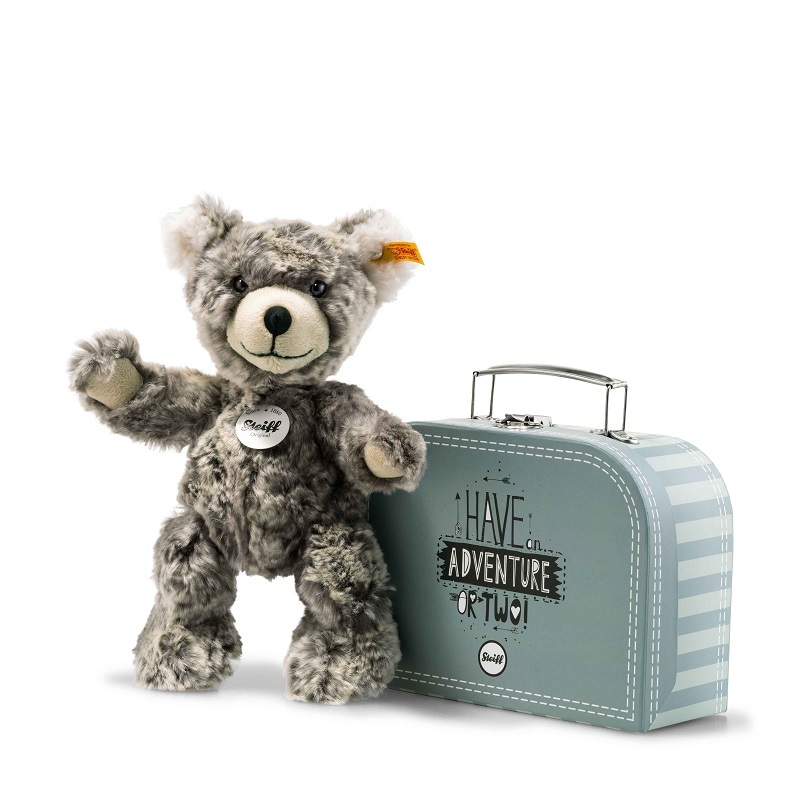 He is machine washable at 30° C (suitcase not washable) and has the CE mark for safe toys. Steiff EAN 109911 Lommy Teddy in suitcase, 25cm. 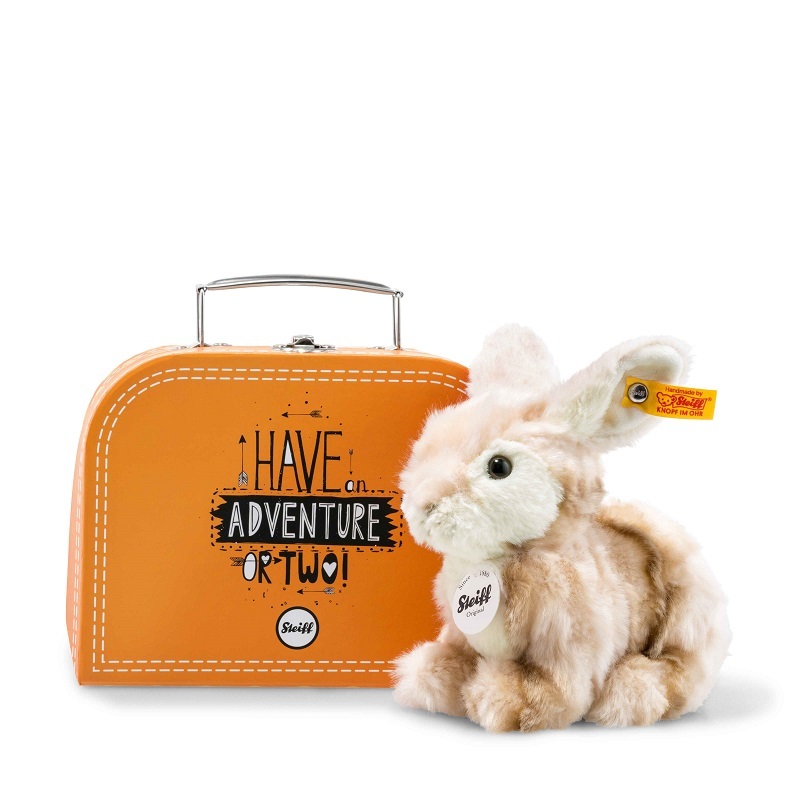 Steiff EAN 080449 Melly rabbit in suitcase, 18cm. Melly is made out of soft cream/multicoloured plush. He is filled with synthetic filling material. Melly has an airbrushed nose and safety eyes. Melly has a stainless steel button in his left ear. 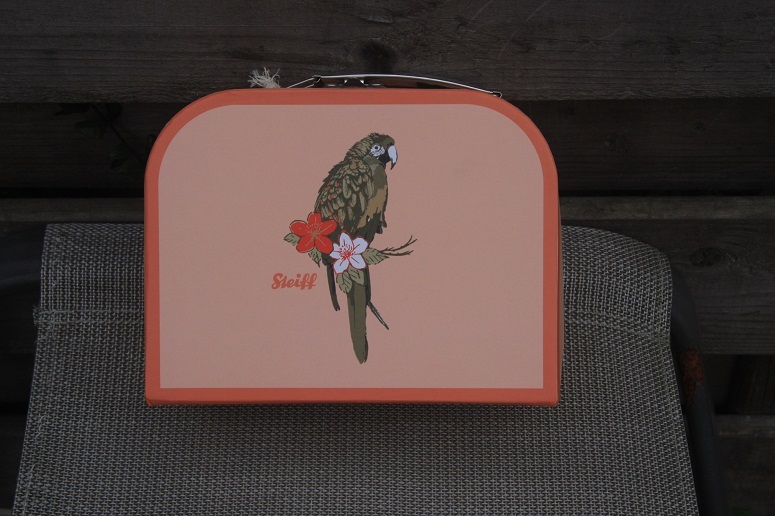 Steiff EAN 099472 Lucy Cat in suitcase, 18cm. Steiff EAN 079160 Matty dog in suitcase, 18cm. Matty is made out of soft grey and white plush. He is filled with synthetic filling material. Matty has a plush nose and safety eyes. Matty has a stainless steel button in his left ear.